Most visitors come to Yellowknife in Canada’s Northwest Territory for one thing and one thing only: to see the northern lights. Its location on the 60th parallel (sub-arctic), flatness, and lakes makes it one of the best places in the world to see the auroras. As seeing the northern lights is an exclusively nighttime activity, I was worried that there wouldn’t be anything to do during the day, Yellowknife being a small (20.000 people) and remote town. Fortunately we heeded the advice of our host and came in March when the temperature is milder (usually I wouldn’t call -23F ‘mild’ but it’s all relative) and there’s enough daylight to do stuff around town. Each year in March, the Snowking and his helpers build a snowcastle on Yellowknife Bay. Like the name suggests, it’s a castle made completely of ice and snow. The snowcastle acts as a venue for local bands and performers in weekend evenings. During the day, the castle is open for visitors. The highlight of our visit was the giant slide made completely of ice. SO.MUCH.FUN. So fun we had to elbow kids out of the way. That alone made it worth the $5 admission. Surrounding the snowcastle are colorful houseboats, stuck in the frozen lake water for the time being like M&M’s on vanilla frosting. For you guys who are used to super cold weather, this might not seem like a big deal. 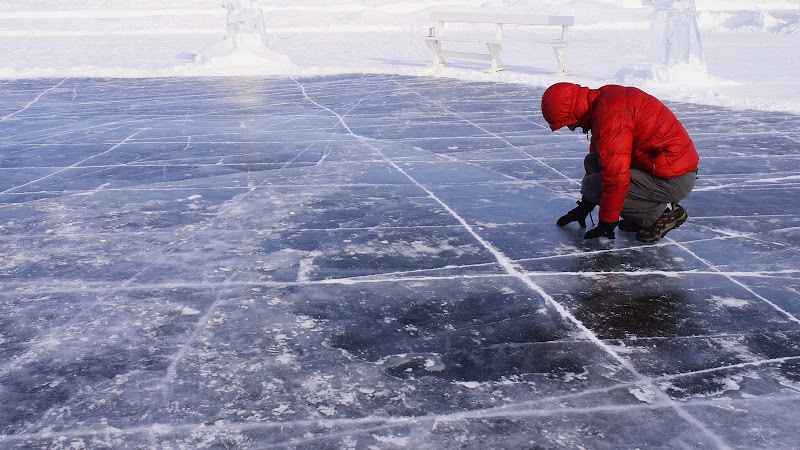 But for us, the fact that whole lakes can freeze solid, so solid that trucks can drive on them, is just wild. We’re talking BIG trucks too – did I mention this is where the TV show, Ice Road Truckers, was filmed? Of course we had to check to make sure that we just won’t randomly collapse into the lake by stomping and jumping on the ice as hard as we can. And pushing it very firmly with our hands. Very scientific-like. We’re driving on a lake! Bullocks Bistro serves arctic char, pickerel, trout and other locally sourced fish. The menu is simple, “Do you want your fish deep fried, pan fried, or grilled?” and at $30+ per plate, it’s not cheap. But nothing in Yellowknife is. The kingfisher plate – an assortment of local fish, grilled, and doused in delicious dressing. Despite the price, the restaurant had a casual, ‘old town’ atmosphere that we enjoyed. It could get crazy busy though. 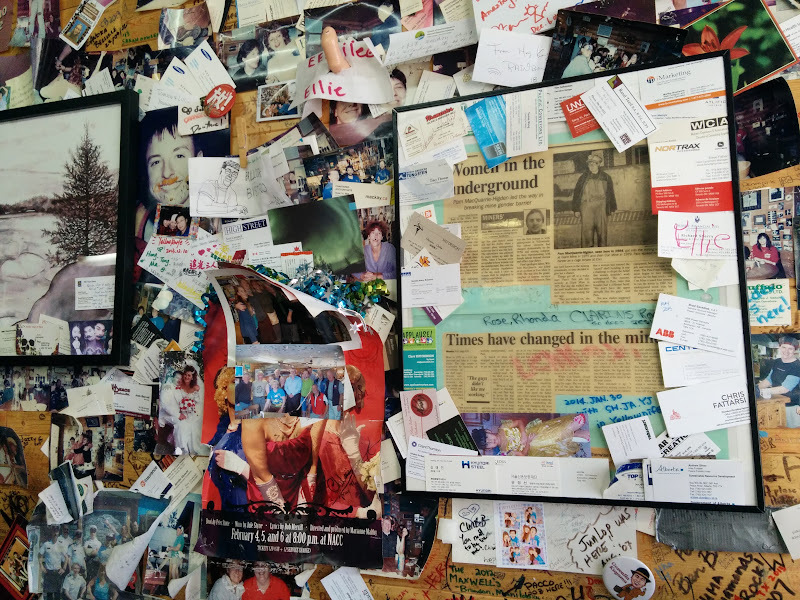 The interior of Bullocks Bistro: walls covered with bumper stickers, business cards, posters, and what not courtesy of previous clients. And of course there’s the snow. The crunch of dry snow beneath our feet and the blinding whiteness that filled our vision wherever we looked were our constant companions. 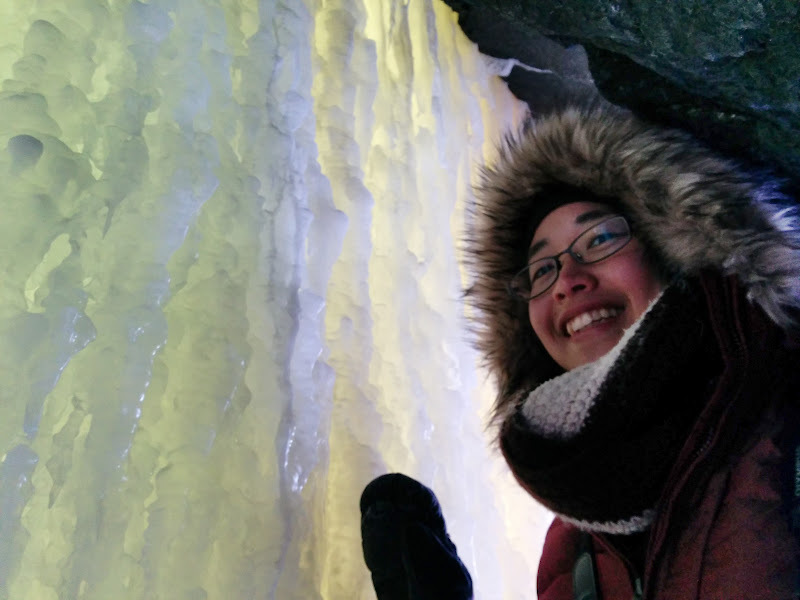 We visited an ice cave, an hour trek away from town. Life in this town is so vastly different than what we’re used to everything was novel and exciting in our eyes: the snow (so much! ), the cold (so cold! ), the bush planes, the ice roads… even the license plate! 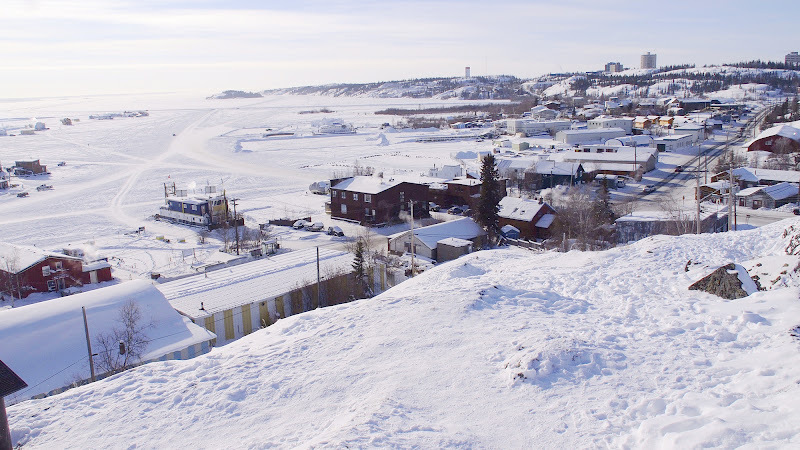 Spring time is a fun time to visit Yellowknife. The harsh winter is behind and sunshine is aplenty while the northern lights graze the night sky. It takes a special kind of toughness and hardiness to live this far north. I don’t think we’d make it a year. How about you? I had never thought that you’d be able to see the Northern Lights from there. What you show looks good, too, Jill. Neither did we. Not to mention the fact that not only can you see the northern light, it’s actually one of the best places in the world to see it. 260 days out of the year or something like that is the statistic. 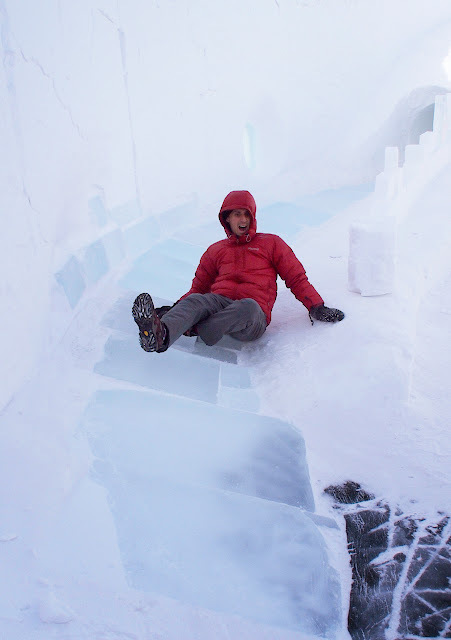 I’ve never heard of Yellowknife before, but it looks like a fun winter destination! Looks like you guys had a great time and I was following your adventure on Twitter (@Uptowngirl). It’s amazing how much you can adapt to the cold. I’ve been living here for 2 full years and I swear my blood has gotten thicker! Bullocks is one of the more expensive places in Yellowknife, our food prices aren’t all that much more than other parts of Canada (our milk is cheaper than in Ontario). I highly recommend a visit here in late June when we have 22 hours of daylight, it’s 25C almost everyday and you can golf at midnight! Our summers make it worth getting through winter! I’d love to come back in the summer and see the lakes. And the whole 22 hours of daylight thing is so hard to imagine, it’d be an interesting experience. It looks awesome guys! That snow castle is pretty impressive. So glad you visited during March!! 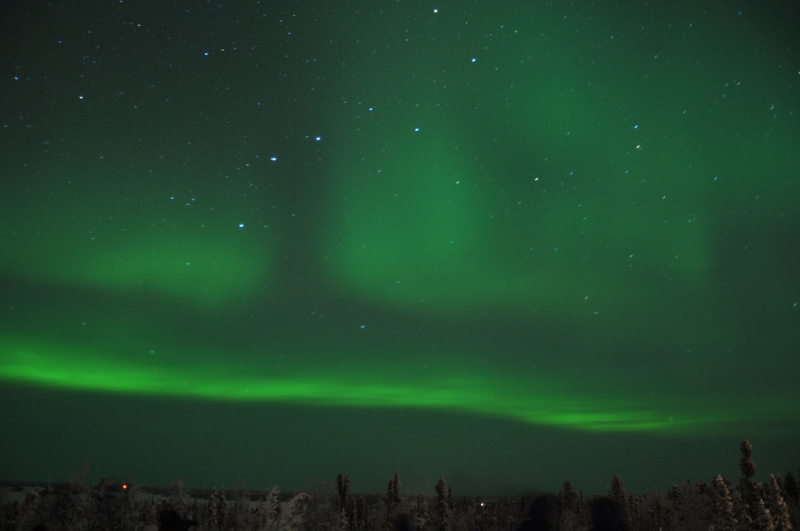 It was definitely our favorite month in Yellowknife with more daylight, the festival, and still awesome northern lights! Great photos of all your activities by the way! 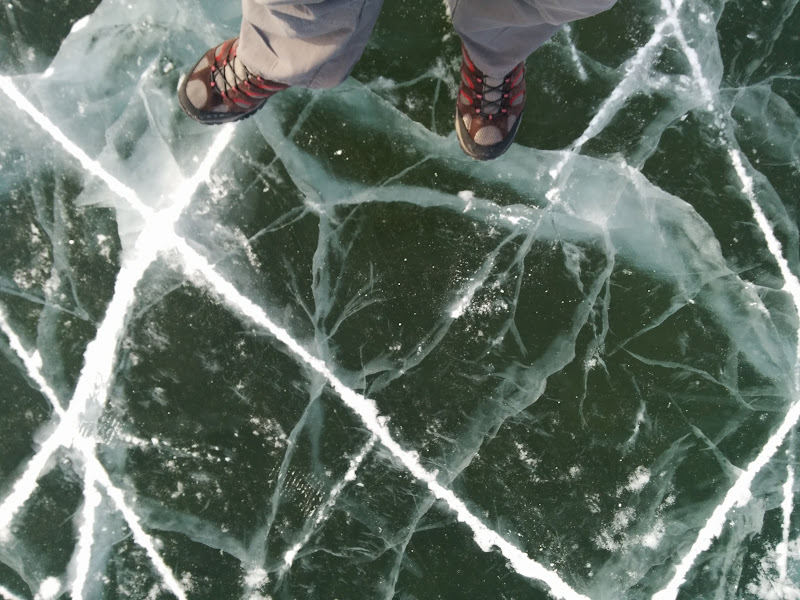 That ice road is crazy to look at in person and your pictures totally capture the depth. I feel COLD from just looking at your pictures! The ice-road seems REALLY REALLY cool (hee! pun intended) though.